Unexpected surprises are the best surprises. can you categorically confirm/deny oni ayhun's connection to the knife? @ jack: PC was the first to guess it was half of knife. whether his guess was right or not, i honestly dont know. and i dont care that much either. he is just oni to me. what a way to start the week.. If I will ever make a movie, he is also a contender to make the soundtrack. Seriously now, impressive and interestingly rough (+). And as usual: big thanks for mix! This is really wicked. Great analog sounds, rough metallic production. Definitely perfect to kickstart the week. Cheers. 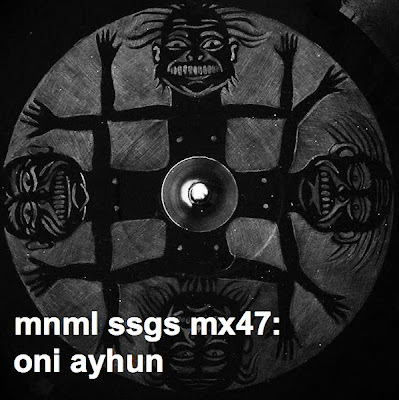 mnmlssg was starting with mixes by norman nodge and similiar music. now we listen to ambient, krautrock and distorted soundeffects..
do we loose chris/pc in the outer space? This was completely out of the blue, very nice turn guys. I have just finished it first time through. It is really experimental and innocent, definitely confirming him as quite a unique talent. Big miss for me, but then they can't all be winners. Experimental is one thing but I at least like them to be musical. Oni Ayhun is Olof Dreijer. One half of The Knife. Listen to OAR003-B and you will instantiously recognize the steelpan sound around 5m30s, that The Knife have used before. really liked this. then i got to work and someone is playing the necks - silerwater and they seem to work together. great start to the day. i agree it definitely has some sounds like the knife have used but whatever. would be interesting to see it done live...any idea what machines/stuff is used? i'm curious about that necks album. from what i hear, it's one of their best. thanks for the mix ssgs, gets me excited about his 4th release. If it is Olof Dreijer, he also did a nice remix of a Nine Inch Nails track back in 2007. Has he done much else under his own name? @ katrin: if you actually have a look, the first mix in the series was an ambient one by bvdub. while the core of the mix series has been more techno and house, we've always planned it being broader than that. these last couple of mixes all fit. i actually thought this was really good... but then again, i have a thing for noisy slow techno. also: lol @ the person who forgot bvdub's mix when considering the 'roots' of this mix series... and what's wrong with outer space? !